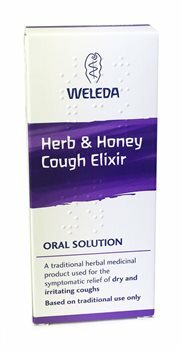 A traditional herbal medicinal product used for the symptomatic relief of dry and irritating coughs. Each 5ml of contains 4g of liquid extract from Aniseed (Pimpinella anisum L) (equivalent to 81mg Aniseed fruit), Elder flower (Sambucus nigra L) (equivalent to 81mg Elder flower), Iceland Moss thallus (Cetraria islandica L) (equivalnet to 81mgIceland Moss thallus), Marshmallow root (Althaea officinalis L ) (equivalent to 81mg Marshmallow root), Thyme herb (Thymus vulgaris L and Thymus zygis L) (equivalent to 81mg thyme herb), White horehound herb (Marrubium vulgare L) (equivalnet to 81mg White Horehound herb). Other ingredients are purified water, honey, sucrose, glycerol and citric acid monohydrate. Adults, the elderly and children over 12 years of age: Two 5ml spoonfuls (10ml) every 3-4 hours, undiluted or in a little water. Up to four doses can be taken daily. Not for use in children under 12 years of age. Do not take if you are allergic to the active ingredients or to Apiaceae (Umbelliferae) (caraway, celery, coriander, dill and fennel) or to Anethole or to memebers of the Lamiaceae family, or to any of the other excipents. Do not take if you have obstruction of the bile duct, cholangitis, liver disease or ileus. If your symptoms worsen or persist after 1 week, consult a doctor or qualified healthcare practitioner. If you experience shortness of breath (dyspnoea), fever or you cough-up any coloured mucus, consult a doctor or qualified healthcare practitioner. Consult your doctor or pharmacist before taking this medicinal product if you have been told by your doctor that you have an intolerance to some sugars, you have a peptic ulcer, gallstones or other biliary disorders. Discard 1 month after opening. Do not use after the expiry date stated on the carton.